What time is it? T-shirt time! NOW is the time to order your very own 15th anniversary Journey shirt! The deadline to place your order is Monday April 29. 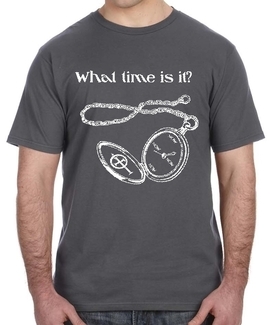 You must order in advance (and pay as well, if possible) in order to get your awesome shirt. We're serious about this deadline, so order NOW. This year's "What Time Is It? Now" design features original artwork by Journeyer Amber Perry on a charcoal colored, super soft, lightweight t-shirt. A full range of sizes is available in men's and women's styles. We will have the shirts available for pick up on Sunday May 19 at the anniversary picnic. We are not setting a specific price for the shirts. Instead, we are using a "pay what you choose/wish/can/want/value" system. The shirts cost Journey $10 each ($12 for 2XL and 3XL) but you are invited to pay an amount you choose. If money is a little tight and you can only pay $5, that's okay. If you're feeling flush and want to kick in a little or a lot extra, that's cool, too. All money collected beyond our production costs will go to support Journey as we do our best to be God's Hands in the world. Check the "SIGN UP" box for each size shirt your are ordering. You can check as many sizes as you wish. Click the big "SUBMIT AND SIGN UP" button at the bottom of the page. In the required "QTY" field, tell us how many shirts of that size you are ordering. You must enter your name and e-mail address. Enter your mailing address only if you want us to ship your order. Tell us your delivery and payment preferences. Click the big "SIGN UP AND PAY" button or the "SIGN UP WITHOUT PAYING" button at the bottom of the page. If you choose "SIGN UP AND PAY", you will be redirected to PayPal where you may pay with your PayPal account OR with a credit card if you don't wish to use PayPal. We appreciate all advance payments. If you choose to pay later, we accept cash, checks, and credit cards in person. Contact the Head T-Shirt Wrangler if you have any questions.